Featuring a motherload of new content – including a prequel story, a 13th job (the Calligrapher), a brand-new character, all-new monsters, and more – Legend of Shara adds both breadth and depth to Tangledeep’s 100+ hours of gameplay for only $7.19 through April 11. 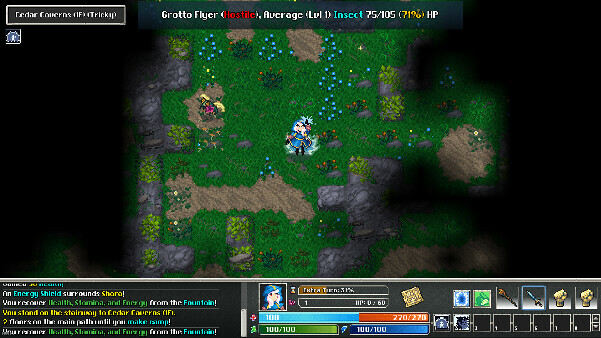 Originally released on July 2017 as a Steam Early Access title, Tangledeephas steadily become one of the most beloved roguelikes for PC, Mac, Linux, and Nintendo Switch – amassing fans, positive press reviews, and awards from the Steam Early Access days to its full launch in Summer 2018. With nostalgia-proof pixel art, polished gameplay – and a star-studded soundtrack by Hiroki Kikuta, Grant Kirkhope, Norihiko Hibino, and Andrew Aversa (who also happens to be the game’s lead developer) – Tangledeep has done the impossible by appealing to RPG, strategy, and roguelike fans alike. Legend of Shara allows you to play as Shara in a new prequel that takes place before the story of Mirai – Tangledeep’s original protagonist. 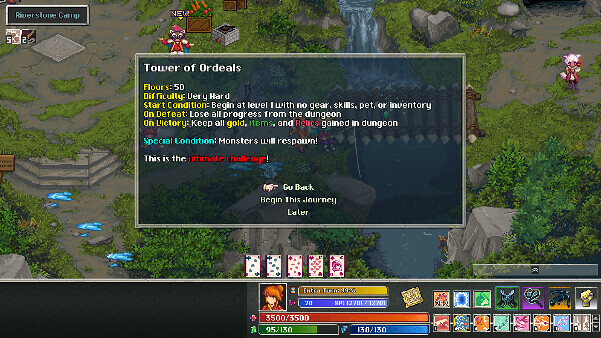 While the core dungeon progression is similar to the main game, the dialogue and bosses are quite different. In this gameplay mode, there isn’t a town, meta progress, or job system. Shara does not gain XP nor levels like Mirai does. Instead, you can spend JP (Job Points) to level up your core stats. By doing so, your XP level increases gradually. Open Pandora’s Boxes: Each Box gives you an option of three random skills from the entire pool of regular job abilities. Pick one – and off you go! Rest at Campfires: When you rest, you can take your pick of several random Shara-only abilities. You’ll have to plan and adapt on the flybased on the items and abilities you find! To the Calligrapher, the pen and sword are equally mighty and lethal. Drawing upon ancient writing and runic knowledge, Calligraphers engage their enemies wielding two weapons at once – reading from powerful elemental scrolls, and striking down opponents with furious brushstrokes. This job is focused on attacking and dodging; it’s an all-out offense playstyle that rewards building up huge attacks. In Riverstone Camp, you may now encounter a new character known as the Mysterious Wanderer. This enigmatic storyteller will introduce you to “Wanderer’s Journeys” – randomly-generated adventures that range from 10 to 50 (!) floors. Unique Dungeons: Each Journey has an entirely unique dungeon layout. Some are full of tight, windy corridors connecting large rooms together – while others are more naturalistic, with wide-open spaces and water. Each has different biomes and environments to explore. Strange New Creatures: Unlike the rest of the game, every Journey has a completely new set of randomly-generated monsters – complete with accompanying names, sprites, and powers. You’ll have to observe these new threats carefully because you never know what you might find! Different Scenarios: Some Journeys will allow you to bring along your skills, stats, gear, items, or a combination of these resources. Others will start you at Level 1 with nothing at all! Regardless of your skill level and progression in the main game, you’ll find a variety of different gameplay styles and challenges to enjoy. Ancient & Powerful Relics: Through playing and completing a Wanderer’s Journey, you will find new types of item called Relics. These are extra-special Legendary items that are randomly generated from hundreds of existing powers, bonuses, properties, and stats. There are weapon, armor, shield, book, quiver, and accessory relics to discover – all with limitless possibilities! Shara’s Story: A new tale in the world of Tangledeep with a unique story, boss encounters, and new gameplay. 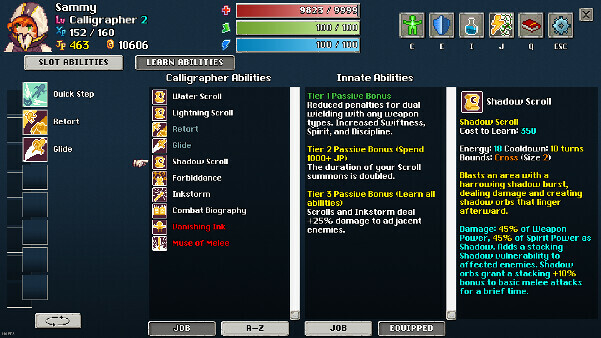 Calligrapher (13th Job): Wield two weapons, make use of elemental scrolls, and indulge in devastating combo attacks. Level Cap: There are even more powerful items and challenges to discover with a level cap increase from 15 to 20! New Monsters: There are dozens of new monsters with new powers that you can capture and tame. Riverstone Waterway Start: A new early-game path with slightly more challenge and greater rewards begins in Riverstone Waterway rather than Cedar Caverns. Realm of the Gods: New post-game area with the toughest monsters and champions imaginable! Mysterious Wanderer: Encounter this brand-new character and explore Wanderer’s Journeys with new dungeons with bizarre creatures, scenarios, and treasure. Ancient Relics: Get your hands on rare items with limitless combinations of legendary powers and bonuses. Item Dreams: Twist and warp areas you’ve already visited with new events, monsters, items, and objects. Runes of Knowledge: Unearth this set of tablets, which teaches special abilities not found anywhere else. New Content Everywhere: Monster sprites, tile sets, layouts, item graphics, effects, music, and more! The Legend of Shara DLC is now available on Steam and GOG for $7.19 – 10% off the retail price. A bundle containing the base game, Legend of Shara, and the DLC’s soundtrack can also be purchased on Steam for $15.20 (34% off). Tangledeep itself will also be discounted by 30% to celebrate the launch of Legend of Shara! All sales will end on April 11.